The Board of Education of the New Richmond Exempted Village School District at its June 22 meeting hired two administrators with ties to the district to lead its Monroe and New Richmond elementary schools. 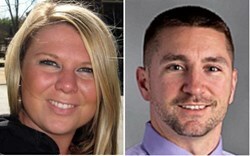 Jamie Kunz, a New Richmond resident whose children attend New Richmond schools, was hired as the new principal at New Richmond Elementary and William Craig Horn, a 1999 graduate of New Richmond High School, was hired as the new principal at Monroe Elementary. Both Kunz and Horn have backgrounds in the important area of special education. “I am passionate about education and strive to help all students achieve success and believe that all children can learn in a learning environment that is stimulating, comforting and appropriate to their unique talents and abilities,” said Kunz, who has been the principal at Hamilton’s Fairwood Elementary School since 2012. She previously worked as an assistant principal at Hamilton’s Garfield Middle School in 2011-2012 and as dean of students at Fairwood from 2009 to 2011. Kunz was graduated from Miami University in 2004 with a B.S. degree in Integrated Language Arts Education and received a M.S. degree in Curriculum & Teacher Leadership from Miami in 2005 and is currently enrolled in post-graduate studies at the University of Dayton. “I live in New Richmond with my husband and three children and I very much look forward to working with the students, parents, staff, and community members of New Richmond Elementary,” said Kunz, who replaces the retiring Terry Miller at NRE. Horn received a B.S. in Education degree from Georgetown College in Kentucky in 2003 and a Masters in Educational Administration from Xavier University in 2007 and is currently taking a post-graduate course from Florida State University in Educational Leadership. “As a NRHS graduate with the class of 1999, I couldn't be happier to accept a position with the district where I was inspired to be an educator, and more specifically, to be an educational leader,” said Horn, who taught for four years at Campbell County (Ky.) schools before moving to Florida where he held positions as a special education teacher, special education program coordinator, dean of students, curriculum specialist, and assistant principal. He had an opportunity to return home last year and accepted a position as assistant principal at Mt. Healthy North Elementary. Even though I had a position in Mt. Healthy, I bought a home in New Richmond, and I'm excited to live and work in the community where I grew up,” said Horn, who replaces Joe Roach as Monroe’s principal. Roach moves to New Richmond’s Locust Corner Elementary where he succeeds Dr. Tara Rosselot, who is moving to New Richmond High School as a language arts teacher.